To anyone who is skeptical about interspecies communication, consider the following. I am lying in the grass just outside Julie’s den filming the three cubs, one lion and two tigers eating on a blesbuck carcass. I am capturing, on film, their first ever taste of meat. A huge Karoo storm is rolling in from the north. Suddenly a bolt of lightning slams into the hill off on the northwestern side of the boma, accompanied by a loud thunder clap. Two cubs panic and run away from the den into tall grass. The third freezes with fear. Heavy rain follows the thunder and lightning. 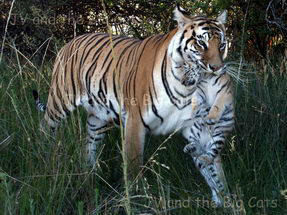 Julie calmly picks up the cub at hand in her mouth and carries it into the den. I abandon my policy of not touching the cubs and go after the two terrified cubs. I find the one and, holding it by the scruff of the neck, I bring it back to the den. The cub hangs absolutely limp. Instinctively it knows it’s a time of danger and it must co-operate totally. I meet Julie at the entrance to the den. Visibility is almost nil in the pouring rain. 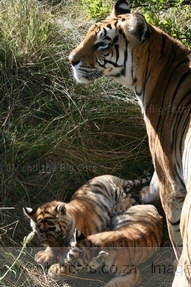 I hold the cub in front of her, inviting her to take it from me. Gently she raises her paw onto my forearm pushing my arm gently onto the ground. I release the cub. Now she grips the cub in her massive jaws and carries it back into the den. I am wondering who the most intelligent species is in this time of crisis. I go after the third cub but am unable to find it in the tall grass and blinding rain. I get down on all fours, searching through the grass. Still nothing!. Then I hear a chuffing sound behind me. Julie is standing with the third cub in her mouth and she is just letting me know she has the cub. She moves back to the den, cub hanging limply in her mouth. At the entrance to the den she pauses and turns her head towards me and chuffs. In the language of the tiger she says “Thank you”. I chuff back. In the language of human beings I say “You are a clever, caring mother and you did good”.